Choosing the right kitchen sink from dozens of styles available can be a bit overwhelming. You might feel like drowned in a sea of kitchen sinks and faucets. No need to worry. We are here to help you out. First decide whether you want to replace the existing kitchen sink only or plan to renovate the whole kitchen. If you plan to upgrade your kitchen with a new sink only, then measure the area to know the exact dimensions. Of course, your options are better, if you decide to renovate the whole kitchen. 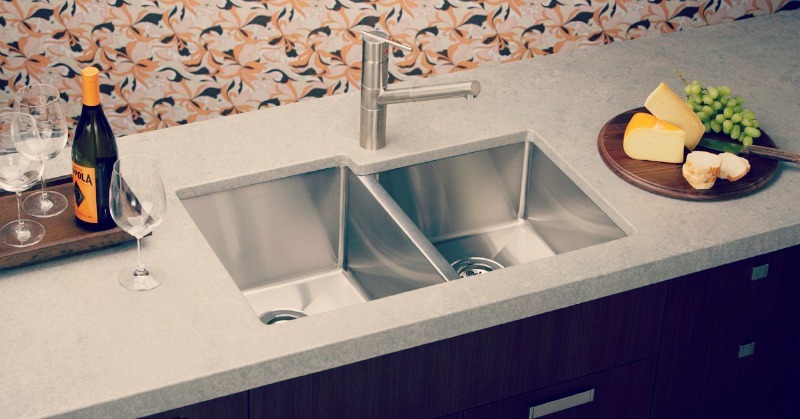 One thing to consider when choosing the right sink material is the counter-top. If you have a solid surface counters like concrete, granite or marble, and are looking for sophisticated style, then you have lots of options to choose from. Beside the aesthetics, you will need to consider other things like cost, functionality and durability. A stainless steel sink is in some sense, a standard, but can also choose cast iron, composite granite, acrylic, quartz and more. The type of the material you are going to choose will mostly depend on your kitchen style. Let’s take a look at some of the most popular sink materials. The most popular choice for kitchen sink is the stainless steel. One of the most durable and wear resistant sink material ever that features chromonickel content. These two components make the stainless steel sink a durable, strong and shock resistant heavy duty utensil. If you are looking for hygienic, heat and rust-resistant sinks, then stainless steel should be on your priority list. Now, bear in mind that not all stainless steel sinks are the same. They vary in style, size and price. Cast iron is another durable sink material. In most cases, these sinks are coated with porcelain enamel to increase the durability and the hardness of the same. Fire clay sinks are made from clay that is fired at extremely high temperatures. This makes these sinks highly resistant to stains and scratches. And are pretty easy to clean too. Solid surface sinks on the other hand are perfect for solid surface countertops. They create a nice flaw in the kitchen and scratches are less visible compared to other sink materials. Sinks made of acrylic are very resistant to stains but not tolerant to high heat. Acrylic sinks have a smooth surface that is easy to clean and maintain.